This image shows the region around the well-studied Hyades star cluster, the nearest open cluster to Earth. A pre-dawn celestial pageant well worth getting up early to see will take place Sunday morning (July 12), with a lovely crescent moon in close proximity to one of the most beautiful star clusters. The constellation of Taurus, the Bull, will be coming up over the east-northeast horizon at around 3:30 a.m. local daylight time. The famous Pleiades star cluster is in the Bull's shoulder, while the Bull's face is plainly marked by the fine, V-shaped Hyades cluster. The Hyades grouping is among the nearest of the star clusters, which explains why so many of the separate stars in this cluster can be seen. 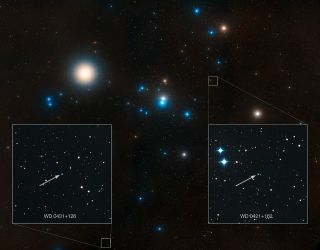 At a distance of 130 light-years, the Hyades members travel through space like a flock of geese, moving in the general direction of the star Betelgeuse in Orion, while receding from Earth at the rate of 100,000 mph (160,000 km/h). Aldebaran is moving toward the south almost at a right angle to the cluster's motion, and twice as fast. Taurus' V-shaped head is, therefore, going to pieces. For 25,000 years or more, it will pass for a V, but after 50,000 years, it will be quite out of shape. As dawn breaks in North America on Sunday, a thin, waning crescent moon will enhance the view of the Hyades. Earth's satellite will be 14 percent illuminated, just three days from new phase, and floating only a few degrees to the upper right of Aldebaran. To the unaided eye, and especially through binoculars or a small telescope, the waxing crescent moon will appear as a thin arc of yellowish-white light enclosing a ghostly ball. This vision of the full globe of the moon, its darkened portion glowing with a bluish-gray hue interposed between the sunlit crescent and not-much-darker sky, is sometimes called "the old moon in the young moon's arms." Leonardo da Vinci (1452-1519) was the first to recognize this lunar glow as "earthshine," light from the Earth reflected back to the moon. The Earth's light, of course, is reflected sunlight, so earthshine is really sunlight that's reflected off Earth to the moon and then reflected back to Earth again. If you're using binoculars, notice how, as the morning progresses, the moon shifts (at its own apparent diameter each hour) past the 4th-magnitude star Gamma Tauri, the star located at the bottom of the V.
The appearance of Taurus, with Aldebaran, the Pleiades and Hyades low in the east-northeast sky before sunrise, demonstrates that the progression of the seasons is unending. The first appearance of these particular star patterns is a gentle reminder that skywatchers can now look down the long celestial runway and see the first signs that fall is coming, albeit with still a few months to go.